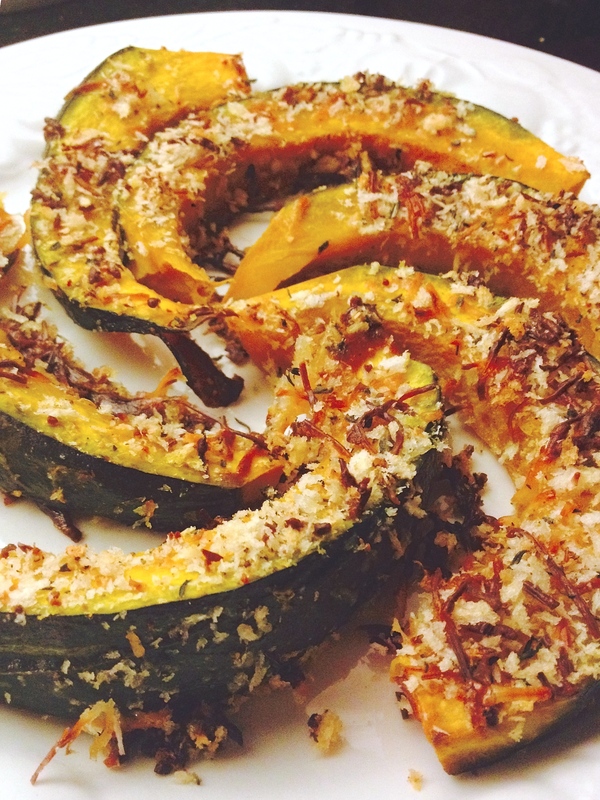 Creamy pumpkin topped by crunchy parmesan-herb topping….parmesan, sage, rosemary and thyme… yes please! Sometimes we think of pumpkin as being a sweet thing (which it is) but it’s so nice to mix it up and try a savory preparation. Bonus: your home will smell heavenly as these are roasting. Thanks to the geniuses at Ottolenghi – every one of their recipes I’ve tried has been outstanding (check out this post for chilled soba noodles with mango, eggplant, and basil, as well as the cookbook, for more Ottolenghi goodness!). One day maybe I’ll make it to their restaurant in London. 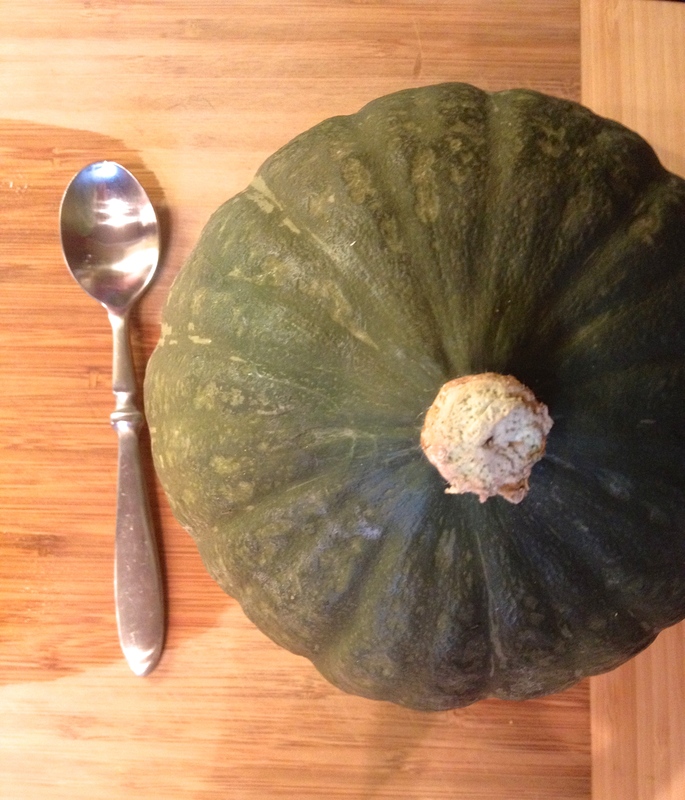 Here is the pumpkin I used to make these wedges (spoon shown for scale) – it’s a small Japanese kabocha pumpkin which seems to be more readily available in American markets these days (I got mine from FreshDirect). I think this would work with any small pumpkin or squash (as long as you can eat the skin). Note this does not include Jack O’Lantern pumpkins… they are not good eatin’, as it turns out (I’m eternally thankful to my friend who educated me on this point!). Hefty & sharp kitchen knife for butchering the pumpkin. Seriously, BE SAFE WITH THIS. Baking sheet and parchment paper for baking the wedges (a silpat would work too). A pastry brush is nice for brushing the olive oil onto the wedges. Assemble Le Wedges: Did you line your baking sheet with parchment paper or a silpat yet? If not, go ahead and do that. In a smallish bowl, mix together the grated Parmesan, panko, minced herbs, lemon zest, and pressed garlic. Pour a little olive oil into a small bowl and get your brush out. Brush each side of a wedge with olive oil, then lay it down on the baking sheet. Do all the wedges. Now sprinkle the Parmesan mixture over each wedge (try not to get it on the baking sheet, but if you do, no biggie – it will just get brown and crisp and delicious. I KNOW, RIGHT?!). Roast ’em: Roast these dudes about 30 minutes. They’re done when you can poke a wedge with a little knife and the pumpkin is soft. If it seems like the topping is getting too brown before they are done, cover with foil and continue, then roast the last few minutes without the foil again. Enjoy!! This is a radish*rose original recipe, adapted from the source(s) named above. All images & content are copyright protected. All rights reserved. Please do not use my images without prior permission. If you want to republish a recipe, please credit radish*rose and link back to the recipe.